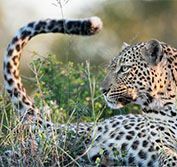 Holidays & tours to the beautiful mountainous Kingdom of Swaziland, now called eSwatini, offer the opportunity to combine a Big Five Kruger safari with the culture, beaches & wildlife of Zululand. 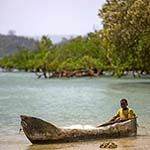 Bordered by South Africa on three sides and Mozambique on the fourth, this small country also offers a wonderful cultural experience in its own right. Located on the route between the famous Kruger National Park and the warm beaches of Durban, holidays & tours to Swaziland - eSwatini - offers the opportunity to break your journey across South Africa’s eastern side, with the added satisfaction of adding a Swaziland stamp to your passport. The Swazi people are renowned for their colourful beadwork, woodcarvings, jewellery, glassware and candle making, as well as their hand-woven baskets. With strong cultural traditions, the welcome here is guaranteed to be warm and expansive, with cultural interactions usually a highlight of all holidays & tours to Swaziland / eSwatini. 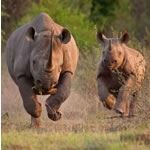 Mkhaya Game Reserve provides sanctuary to endangered rhinos & is a great example of community-based sustainable tourism. For expert advice on holidays & tours to Swaziland / eSwatini, combined with a Kruger safari & Zululand in South Africa, contact our friendly team on 01582 766122. We can tailor make a holiday to your exact requirements. Selling holidays & tours to Swaziland / eSwatini for over 15 years. ALL OUR HOLIDAYS AND TOURS TO SWAZILAND / eSWATINI, KRUGER SAFARI & ZULULAND SOUTH AFRICA ARE FINANCIALLY PROTECTED wherever in the world you live. The highlights of holidays & tours to Swaziland (eSwatini) are usually cultural and we strongly recommend a visit to a Swazi Village where tours are offered, along with dancing & music. These villages showcase traditional Swazi lifestyle & culture, which includes producing intricate & colourful decorative beadwork and hand-weaving. takes place over eight days in late August/early September. During these festivities tens of thousands of unmarried young women dress up in colourful traditional attire, camp out and cut long river reeds which they present to the Queen Mother at her royal residence. On the last day they dance before their king, who traditionally used this celebration to choose a new bride. Little can prepare you for the sheer scale of this pageant, with column upon column of young girls ululating in a giant centipede formation - swaying, stamping and chanting. A truly unforgettable experience on cultural holidays & tours to Swaziland (eSwatini) timed to take in this event. The Swazi game reserves are good examples of sustainable tourism and provide much needed local employment. Mkhaya Game Reserve in particular has been important for its work in the conservation of black and white rhino. 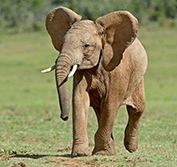 The scenery is spectacular and you can also see plains game, elephant, buffalo and crocodile on wildlife holidays & tours to Swaziland (eSwatini). As well as Mkhaya, there are two other game reserves of note. Hlane Royal National Park is Swaziland’s largest reserve, situated in rugged unspoiled bushveld with lion, elephant, white rhino and giraffe present. Game drives are offered as well as overnight fly camping. The secluded Mlilwane Wildlife Sanctuary is located in the beautiful Ezulwini Valley (Valley of the Heavens). It is home to many antelope including bushbuck, common duiker, blesbuck and klipspringer as well hippo, zebra, jackal and honey badger. This is a good walking and birding destination and also offers horse riding and mountain bike trails. All three of Swaziland’s reserves are within a 1.5-hr drive, so it’s easy to combine two reserves in one day on holidays & tours to Swaziland (eSwatini). Each park offers a contrasting habitat and a range of varied activities, including many that are family-friendly. There is a good choice of accommodation from self-catering cottages to small comfortable lodges. Swaziland’s birdlife deserves special mention as there are over 500 recorded species in the kingdom. Attracted by the many wildflowers, rare plants, and the remarkably wide variety of habitats, there are some bird species here that are hard to see elsewhere. Notable species include the critically endangered Blue swallow, Gurney’s sugarbird, Blue crane, Stanley’s bustard, Southern bald ibis, African broadbill, Red-billed helmet shrike and the Pink-throated twinspot. A total of 48 raptors have been recorded on birding holidays & tours to Swaziland (eSwatini). In addition to cultural and wildlife experiences, golfers can enjoy the championship course at Royal Swazi Spa Country Club and casino. Most holidays & tours to Swaziland - eSwatini - are combined with a Big Five Kruger safari and/or the wildlife & beaches of Zululand in South Africa. This can be done on a self-drive basis, escorted tour, private tour or with resort-based transfers. Explore the wildlife & culture of 3 countries - South Africa, Mozambique & Swaziland - on this wonderful self drive holiday vacation. Visit the beautiful Drakensberg Panorama region, Kruger National Park, Maputo in Mozambique, the Kosi Bay lakes in Zululand & Hluhluwe National Park (with open-top game drives). End your holiday relaxing in beautiful Swaziland. 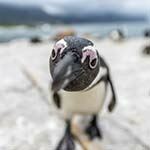 This great value fully escorted tour travels the length of South Africa, from Johannesburg to Cape Town. Visit the beautiful Panorama Route & the world famous Kruger National Park. Then continue through Swaziland, Zululand, Durban, the Drakensberg Mountains & the scenic Garden Route to Cape Town. 2 departures per month, with English speaking guide. Group size 2 to 40. 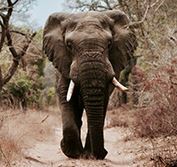 Combine the wildlife & birds of the Kruger National Park and KwaZulu Natal on this amazing self drive holiday, travelling through the mountainous kingdom of Swaziland and Zululand. 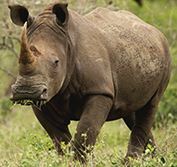 Visit Hluhluwe Game Reserve, famous for preserving the rhino, and St Lucia in the Isimangaliso Wetlands, a birding hot-spot, before relaxing on the warm beaches of the Durban North Coast. 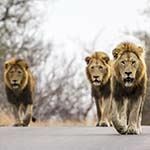 This escorted small group tour travels from Johannesburg to Durban via the Panorama Route and Kruger National Park, including a safari in a private game reserve with open-top game viewing. Continue through Swaziland & Zululand to the iSimangaliso St Lucia Wetlands. Departs very Monday from Johannesburg. Group size 2-26. English & German dual language. No children < 7. 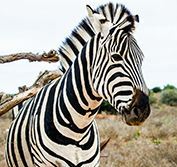 Enjoy this adventurous Mozambique self drive safari holiday vacation, driving a 4x4 vehicle to the small mountain kingdom of Swaziland & the Kruger Park in South Africa, with its incredible wildlife. 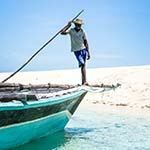 Continue across the border into Mozambique & drive up the coast to Tofu Beach, known for its outstanding diving and Vilanculos - the gateway to the spectacular Bazaruto archipelago. This comprehensive escorted tour combines South Africa's famous Kruger National Park with Swaziland and Zululand. Fly from Durban to Port Elizabeth to continue your adventure, as you travel along the beautiful Garden Route to Cape Town - followed by a few extra days exploring this beautiful city. Departs every Monday from Johannesburg. Group size 2 to 25. No children < 8. This exciting holiday starts with an open-top safari in the Kruger National Park, before driving through Swaziland to the beautiful lakes of Kosi Bay and the unspoilt beaches of Thonga Beach. Enjoy swimming, snorkelling and diving in the warm Indian Ocean, and the opportunity to see turtles nesting between November and February. All game drives included. This comprehensive Overland Tour of South Africa starts from Johannesburg & includes a Kruger safari, the kingdoms of Swaziland & Zululand, Durban, Lesotho, the scenic Garden Route & Cape Town. Travel in a rugged 4x4 overland truck by day & sleep in rest camps and chalets along the way. A camping option is also available. Group size 4 to 18. All specified activities & park fees included. 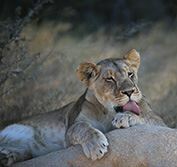 Twice a year the Rovos Rail embarks on an epic journey across South Africa, with diverse game viewing in the Kruger, Hluhluwe & Addo Game Reserves. Your trip includes the battlefield at Spion Kop, the beautiful Garden Route & finishes in vibrant Cape Town. Golfing journey also availables. Departs May & Oct/Nov in Pullman, Deluxe or Royal suite. All activities included. Early booking essential. Journey from Pretoria in luxury aboard one of the Shongololo Trains, which wends its way through South Africa to Cape Town, travelling via the Drakensberg Panorama Route, Kruger Park, Swaziland, Hluhluwe, Durban, Ladysmith, Bloemfontein, Kimberley, Oudtshoorn, George & Knysna on Garden Route and Hermanus. All off-train excursions included, with optional golf. 2 departure per year in each direction. Gold/Emerald.